Josh Graham at Virtual Surreality has a blog on Software development. One of his recent posts caught my eye. 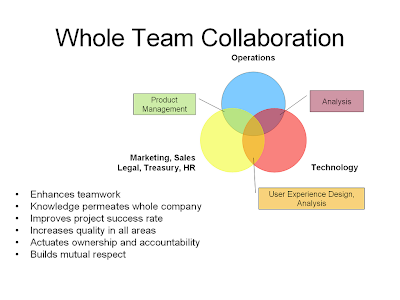 His post on Whole Team Collaboration appears to be a diagram that shows the boundary spanning areas of project teams. Its a way of looking at how business interacts and reminds me of a post I wrote on business analyst knowledge domains.